Computed Electron Micrographs and Defect Identification illustrates a technique for identifying defects in crystalline solids by the comparison of their images, which are produced in the electron microscope, with corresponding theoretical images. 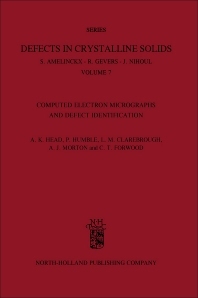 This book discusses the diffraction of electrons by a crystal; the two-beam dynamical equations; the absorption parameters; the deviation of the crystal from the Bragg reflecting position; the extinction distance; the displacement vector; and the foil normal. Chapter three presents the experimental techniques for determination of beam direction, defect line normal, foil normal, foil thickness, and extinction distance. Chapters four to seven explore ONEDIS and TWODIS and their principles. Chapters eight and nine focus on the application and limitations of the technique, while the last chapter explores the different computer programs related to the technique. Post-graduate students, as well as researchers using transmission electron microscopy for studying defects in crystalline solids, will find this book invaluable.